Here's a look back at the fastest cars that we tested in 2018. Every year we see a handful of performance cars enter the Indian market, but 2018 was a little more special as we witnessed some really fast cars arrive on our shores. And they came in all shapes and sizes, literally - SUVs, crossovers, four-door sedans and coupes – we got them all here this year. Luckily, we also got to test some of these speed machines during our annual track day at the Buddh International Circuit. So, without much ado, let’s quickly tell you the vehicles that turned out to be the fastest against the clock. The Ferrari 488 Pista was the fastest and most exciting car that we drove in 2018, period! At this point, you may be wondering if there’s a typo in this post and we’ve mistakenly put ‘GTB’ in the heading instead of ‘Pista’. Well, not really. You see, while the Pista was undeniably the most exciting car that we drove in 2018, it couldn’t make it to the BIC for our annual track day. So, in its place, Ferrari sent us a regular 488 GTB. We didn't complain. 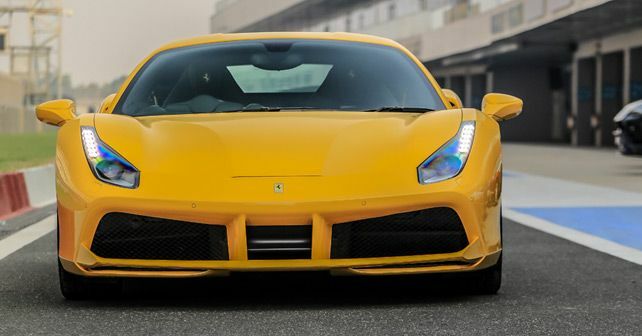 Now even though we weren’t allowed to push it to the limit, the 488 GTB still managed to beat everything else on the track and claimed the Performance Car of the Year award. Lamborghini has always been known for making mad, mad cars. But this one is different, for this is a crossover. When the Urus was announced, the world complained and cringed about it, saying that it’d adulterate the soul of the iconic Italian brand. Well, initially, we were cynical about the Urus as well. But after having driven it on our roads as well as at the track, we were forced to change our opinion. You see, the Urus is a ‘raging bull’ in every single way. The way it annihilates straights and gobbles apexes is absolutely mind-bending. And then, because it has a high ride height than your average supercar, you can drive it all day, every day, as well. It’s a Lamborghini for all occasions, and we genuinely adore it. Let’s begin with some numbers. 612bhp. 850Nm. 0-100km/h in 3.4 seconds. This isn’t a low-slung supercar – instead, it’s a four-door Mercedes sedan that paid a visit to AMG. And what a cracking job that they’ve done with it! The E 63 S AMG is a nutter. It is borderline bonkers. It defies logic and it crackles and pops while doing so. When we drove it, we were simply blown away by its vast range of abilities. It’s a supercar-beater on a racetrack, and on other occasions, this high-performance vehicle doubles up as an everyday four-door sedan. What’s more, at the press of a button, it can also turn into a drift machine. A classic case of ‘all-things-to-all-men’. We all know that the previous-gen Audi RS5 Coupe was a V8 monster. It was a German muscle car of sorts and a very likable one at that. So when Audi launched the new RS5 Coupe – with a downsized turbocharged V6 engine – most of us were skeptical about that decision. However, the numbers don’t lie. You see, despite losing two cylinders, the new RS5 delivers the same 444bhp as its predecessor. Torque, however, has gone up from 430Nm to a whopping 600Nm. And it’s over 50kg lighter as well. There’s still Quattro all-wheel drive. So when you get behind the wheel, all of these factors combined come out really well and the RS5 simply throws all those aforesaid apprehensions out the window. It’s blistering fast and the all-wheel-drive system offers an unbelievable amount of grip. But the best part is that it can quickly switch roles – from a track monster to a comfortable and sedate everyday runabout. And compared to its rivals, it’s priced really well. Which also explains why it emerged at the top of our ‘Best of 2018’ list. In a world where forced-induction is all the rage, the Lexus RC F’s naturally aspirated 5.0-litre V8 motor comes as a refresher. Sure, it may only have 467bhp on tap, but the high-revving nature of this engine is simply unmatched by its rivals. And then there’s its brilliant chassis setup that allows you to take corners flat out. Not to mention, it also has proper sportscar dimensions and it looks quite cool and unique as well. The only fly in the ointment here is perhaps its high price tag because, on all other counts, the RC F delivers the goods. *For our annual track test, we only used the highly technical back-section (north loop) of the BIC. The total circuit length, as a result, was reduced from 5.1km to 2km.